How Security Guards Can Help Apartment Building Owners | COP Security, Inc.
Posted April 20, 2018 by barton_secure & filed under Security Guards. Apartment building owners should consider hiring security guards to keep residents safe. Apartment buildings often involve many tenants all living fairly close together. They tend to share a lot of common spaces, whether it’s their lobby, the hallways, or laundry rooms. Meanwhile, some apartment buildings include amenities like swimming pools or parking garages– all areas that should be watched over by someone who’s good at keeping the peace. When darkness falls and nighttime rolls around, that’s especially when people who are up to no good do their bad things– so that’s precisely when security guards are most needed. Safety and security are paramount these days. 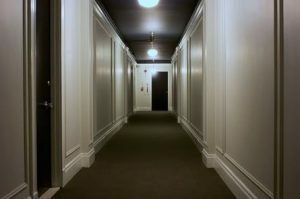 Property managers need to realize that tenants expect to come home to their place and not be harassed or in fear of what they might find, such as shady dealings in the hallway or parking lot. And if there’s domestic violence, isn’t it good that a security guard is on patrol, hears those awful sounds of distress, and ultimately calls the cops to break up the fight? You can’t underestimate the importance of having eyes and ears patrolling the complex. Having security guards on the premises of an apartment building can help deter loitering, criminal activity, and other problems. There’s a difference between a camera watching a place and a human physically being there, watching it. A human security guard is a real-time responder, and that’s a good thing. Also, having one or more guards standing by or walking around shows that the building owners and managers are serious about safety and security. A watched and protected place is a good thing in a society where violence and criminal activity is rampant. In a world that’s becoming increasingly automated and “digital,” one thing’s for sure: it still makes sense to have human security guards watching over a place. COP Security can supply your Rochester, NY-area apartment building with one or more security guards as needed. Committed to providing reliable security, COP also serves other parts of Western New York, including Buffalo and Batavia. For more info about COP’s services and areas covered, please contact 585-750-5608.